Looking for a pinewood derby timer to help you manage the race? Do you need help building pinewood derby car winning designs? Want a finish line timer with a cool, high-tech display that everyone can see? What about pinewood derby software to organize your group's race results? You have found the right place! Welcome to NewBold Products, for the best in pinewood derby timers and developmental tools. In business since 1996, we strive to make our products high-tech yet flexible, easy to upgrade and expand, simple to operate and reasonably priced. We are here to help you have a great race so let us know if you have any questions! We will be posting videos to our new YouTube channel as time goes on. If you're trying to build pinewood derby car winning designs, then we have what you've been looking for! Our timers and finish lines are for Cub Scouts, Royal Rangers, Royal Ambassadors (RAs), Awana, Indian Princesses and Guides and other groups who want to have a great pinewood derby race. We also now sell a great DVD that tells you how to design a fast car, based on the facts of physics! Our pinewood derby timers help your group time the race, display the results, determine the winner and help racers build fast cars with winning designs! This is a must-have in today's world of close competition. Compare us to the others - you'll find we are the best! We sell three unique pinewood derby timing systems. Our top of the line timer is: The TURBO! We spent two hard years developing this new product and you're going to love it. We took all our pinewood derby expertise and created a product that solves every situation, is high-tech, expandable, and affordable!! See the latest information in pinewood derby equipment here. The TURBO Timer can be upgraded to more lanes in the future, as well as to a double-sided version. Our newest product offering is the DerbyStick . This high-tech solution is an amazing evolution in timing technology. We also have the Turbo Lite with all features of the TURBO, except the overhead display AND it costs less! Check this timer out! Also, the Turbo Lite Timer can be upgraded to the TURBO timer in the future! If you have previously purchased one of our Original Pinewood Derby Timers, called the DTX000 series, we have phased out that product, but still sell optional items related to it. Click on Timers to learn about each of the three timer models we offer and determine which one is right for you. If you are simply looking for an easy way to create winning designs, then click here to see our Turbo Lite product and learn how it can help you win! 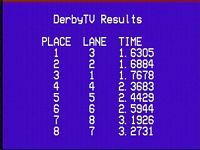 DerbyTV allows you to view race results on a TV Screen without the need for a computer. DerbyPaks are equipment packages that have everything you need and save you money! We are compatible with the top two race management software programs on the market: DerbyMaster and Grand Prix Race Manager. Click here to learn more about software. We have other options for your finish line, like a built-in USB interface, custom carrying cases, and spare parts. Our Turbo and Turbo Lite systems can be upgraded to 8 lanes. The DerbyStick supports up to 4 lanes.